At //SEIBERT/MEDIA, we've been developing and creating software for years. During this time, we've discovered some basic elements that are vital to building products that gain wider marketplace acceptance and are, ideally, exciting. 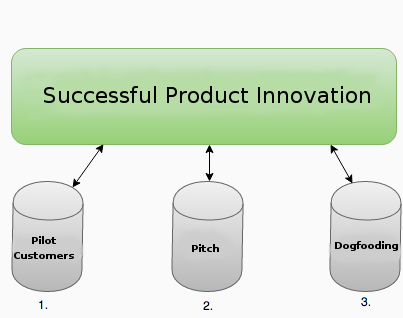 When I hear about dissatisfied customers or projects that failed, it's usually because we've neglected to consider at least one of the following "three pillars of successful product innovation." I now regard them as essential to our success as a product provider. The story of our Confluence-based social intranet platform, Linchpin, began when we collaborated with a pharmaceutical and medical device company. Its goal was to build a global intranet based on Atlassian Confluence. Our customer sent a representative to our office for biweekly, full-day visits. The representative was often attended by our entire team to talk about the customer's needs and challenges. We've also worked with pilot customers on many other development projects since then. These pilots help us understand our customers' needs in depth while getting direct feedback on features and improvements. If we work closely with our customers and have an open exchange of ideas, we're more likely to gain a comprehensive understanding of the problem, and thus create a successful solution. If we neglect the first pillar, we risk building a product where we don't fully understand its true purpose. The challenge in a Pillar 1-based product solution is that there's always the risk of having developed something too specific for the pilot customer. This is where the difference between a service project and product development comes into play. Pillar 2 helps ensure that product development doesn't just apply to one specific customer, but rather to many. The motto is "pitch, pitch, pitch." This is why I show Linchpin Mobile to every contact that I can. Customers who aren't currently acting as pilots and steering development are valuable. They can show us where there might be common standards, as well as where solutions might need individual customization. If we neglect the second pillar, we risk building a product so specific that it wouldn't fit most potential customers. The best way to understand our product's strengths and weaknesses is to actually use it on a daily basis. Even when using it might not always directly apply to us, the internal installation of an add-on, for example, helps us identify cross-compatibility and, of course, find errors before a customer does. It's important to keep in mind whether or not we see ourselves as the product's target group. If necessary, we need to validate the information we learned in "Pillar 2 - Pitch, Pitch, Pitch" with customers from the target group. If we neglect the third pillar, we run the risk of not properly understanding the strengths and weaknesses of our own product, and we'll first learn of errors from our customers. Of course, these three pillars alone don't offer a quick and easy solution, on which every idea and product should be based. Product development is complex and can't just be simplified into three easy steps. But an in-depth look at customer needs and wants, the constant comparison with broader market demands, and a thorough understanding of the solution are fundamental prerequisites for successful product innovation. As a practical guide, these three pillars are definitely helpful and meaningful.